Dmytro Pavlyuk (center) in the title role of Mussorgsky’s “Boris Godunov,” staged by Commonwealth Lyric Theater. 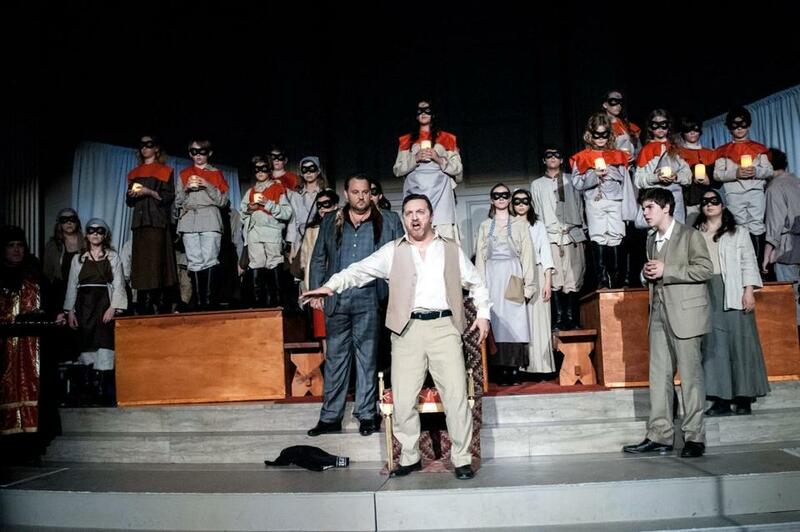 NEWTON — The Commonwealth Lyric Theater is a small local opera company that tends to dream big and to exceed expectations. On Thursday night, they did it again. Not that one quite knows what to expect when contemplating the prospect of a fully staged performance of Mussorgsky’s sweeping operatic masterwork “Boris Godunov” scheduled to take place in Newton’s City Hall. Yet despite being streamlined in length and much-reduced in orchestral forces, this account delivered the jolt of real Russian opera steeped in an authentic tradition. It was feisty community opera theater, sparked by high artistic ambitions and the vocal goods to make them credible. Artistic director Alexander Prokhorov’s staging aimed for a realism untethered to a particular time or place, inviting the audience to consider this iconic work adapted from Pushkin not only as a historical tale of a murderous Russian Tsar, but also as a broader moral parable about political leaders, the sources of their power, and the psychology of the crowds that both adore and revile them. That said, even while reaching for the universal, this production also seemed to have particular cultural contexts in mind. The crowd naturally was full of native Russian speakers, and the staging did not shy away from playing on tropes of communal memory with links to places far from Newton’s leafy streets. At one point, uniformed officials brusquely walked among the audience shining flashlights and growling orders in Russian. The woman seated next to me leaned over and clarified, in a knowing whisper: They were demanding to see identification. The rest of the large cast was capable and often more than that, with Nathan Baer as Pimen, William Meinert as Varlaam, Mikhail Urusov as Shujsky, Adam Russell as the Holy Fool, and Jonathan Price as Grigory. Adrian Bryttan's conducting had ample shape and rhythmic drive, and the choral singing, too, boasted a level of cohesion that seemed a marked improvement from the company’s previous production at a church nearby. Judging from the vigorous ovation at the end of Thursday’s performance, this “Boris Godunov” hit its mark, and no doubt left plenty of listeners wondering just what this adventurous company will take on next. I’ll admit it’s tempting to joke about picturing “Khovanshchina” in a local park, or Prokofiev’s “War and Peace” at the Newton Free Library. But one would have never imagined a rewarding “Boris Godunov” in Newton’s City Hall. Until they did it.